Also known by its astronomical name C/2010 X1, the comet was first detected on Dec. 10, 2010 by Leonid Elenin, an observer in Lyubertsy, Russia, who made the discovery “remotely” using an observatory in New Mexico. 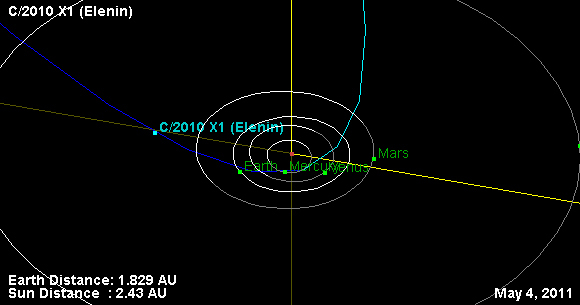 At that time, Elenin was about 401 million miles (647 million kilometers) from Earth. Since its discovery, Comet Elenin has – as all comets do – closed the distance to Earth’s vicinity as it makes its way closer to perihelion, its closest point to the sun. NASA scientists have taken time over the last several months to answer your questions. Compiled below are the some of the most popular questions, with answers from Don Yeomans of NASA’s Near-Earth Object Program Office at NASA’s Jet Propulsion Laboratory in Pasadena, Calif., and David Morrison of the NASA Astrobiology Institute at the NASA Ames Research Center in Moffett Field, Calif.
Q: When will Comet Elenin come closest to the Earth and appear the brightest? A: Comet Elenin should be at its brightest shortly before the time of its closest approach to Earth on Oct. 16, 2011. At its closest point, it will be 22 million miles (35 million kilometers) from us. Q: Will Comet Elenin come close to the Earth or between the Earth and the moon? A: Comet Elenin will not come closer to Earth than 22 million miles (35 million kilometers). That’s more than 90 times the distance to the moon. Q: Can this comet influence us from where it is, or where it will be in the future? Can this celestial object cause shifting of the tides or even tectonic plates here on Earth? A: There have been incorrect speculations on the Internet that alignments of comet Elenin with other celestial bodies could cause consequences for Earth and external forces could cause comet Elenin to come closer. “Any approximate alignments of comet Elenin with other celestial bodies are meaningless, and the comet will not encounter any dark bodies that could perturb its orbit, nor will it influence us in any way here on Earth,” said Don Yeomans, a scientist at NASA JPL. Q: I’ve heard about three days of darkness because of Comet Elenin. Will Elenin block out the sun for three days? A: “As seen from the Earth, comet Elenin will not cross the sun’s face,” says Yeomans. Q: I’ve heard there is a “brown dwarf” theory about Comet Elenin. Would its mass be enough to pull Comet Honda’s trajectory a significant amount? Could this be used to determine the mass of Elenin? Q: If we had a black or brown dwarf in our outer solar system, I guess no one could see it, right? Q: Will Comet Elenin be visible to the naked eye when it’s closer to us? I missed Hale-Bopp’s passing, so I want to know if we’ll actually be able to see something in the sky when Elenin passes. Q: This comet has been called ‘wimpy’ by NASA scientists. Why? Q: Why aren’t you talking more about Comet Elenin? If these things are small and nothing to worry about, why has there been no public info on Comet Elenin? A: Comet Elenin hasn’t received much press precisely because it is small and faint. Several new comets are discovered each year, and you don’t normally hear about them either. The truth is that Elenin has received much more attention than it deserves due to a variety of Internet postings that are untrue. The information NASA has on Elenin is readily available on the Internet. (See http://www.jpl.nasa.gov/news/news.cfm?release=2011-135) If this comet were any danger to anyone, you would certainly know about it. For more information, visit NASA’s AsteroidWatch site at http://www.jpl.nasa.gov/asteroidwatch/. Q: I’ve heard NASA has observed Elenin many times more than other comets. Is this true, and is NASA playing this comet down? A: NASA regularly detects, tracks and characterizes asteroids and comets passing relatively close to Earth using both ground- and space-based telescopes. The Near-Earth Object Observations Program, commonly called “Spaceguard,” discovers these objects, characterizes a subset of them and predicts their paths to determine if any could be potentially hazardous to our planet. For more information, visit the NASA-JPL Near Earth objects site at http://neo.jpl.nasa.gov/ . Q: I was looking at the orbital diagram of Comet Elenin on the JPL website, and I was wondering why the orbit shows some angles when zooming? If you pick any other comet, you can see that there are no angles or bends. A: Many people are trying to plot the orbit of the comet with the routine on the JPL website, without realizing that this is just a simple visualization tool. While the tool has been recently improved to show smoother trajectories near the sun, it is not a scientific program to generate an accurate orbit. Yeomans explains that the orbit plotter on the Near-Earth Object website is not meant to accurately depict the true motion of objects over long time intervals, nor is it accurate during close planetary encounters. For more accurate long-term plotting, Yeomans suggests using the JPL Horizons system. From a NASA Jet Propulsion Laboratory news release. This entry was posted in Uncategorized and tagged comet, comet elenin, elenin, JPL, NASA. Bookmark the permalink.